Be the first to share your favorite memory, photo or story of Khensu. This memorial page is dedicated for family, friends and future generations to celebrate the life of their loved one. 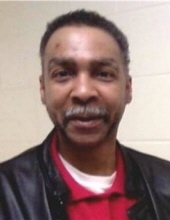 Khensu Ra (Kenny Charles Hughes), 66 of Freeport, Illinois departed his earthly life Friday, April 12, 2019 at his home. Khensu was born November 8, 1952 in Detroit, Michigan. The son of VeElla Hughes and Charles Wormley. Khensu received his education through the Freeport School District. He was inducted into the National Thespian Society, as he loved acting in plays. He graduated in 1970 with honors as a member of the National Honor Society. After high school, Khensu served his country by enlisting in the United States Air Force. After serving his term, he then enlisted in the United States Navy. Khensu confessed Christ at an early age, later in life he became a member of the Islamic Religion “Fahamme”. Khensu developed a love for martial arts early in life, particularly the Korean martial art of Taekwondo. Khensu achieved the highest rank awarded in Taekwondo, Grand Master (9th degree black belt). Khensu started his own style of Martial art called “Ka-Ra-Te-Is”. It was a blend of the traditional Asian Karate with influences from African Cultures. He received his first black belt in 1979 in the art of “Cobra Tack”. He owned and operated his own Karate School in Freeport for many years. Khensu was an avid reader and loved to learn new things. He especially loved reading all kinds of comic books. He also enjoyed listening to music and would occasionally sing a tune. More than anything, Khensu loved his family and loved to see his family come together in celebration. He especially loved the annual family gatherings for Thanksgiving and Christmas. He leaves to cherish his many memories, his parents, VeElla Hughes of Freeport, IL. and Charles Wormley of Birmingham AL, son Heru Ra of Oklahoma City, OK, three daughters Kathleen (Eric) Dittmar of Freeport, IL., Silqet Ra of Astoria, OR, and Taui (Reuben) Gay of Alma, AR. Five grandchildren, Madalynne Dittmar and Jeremiah Dittmar of Freeport, IL., Amaya Ra of Astoria, OR, and Corinne Gay and Ryleigh Gay of Alma, AR; sisters Deborah (Luther) Crumbly of Rockford, IL, Tyra (Johnny) Johnson, Diane Hughes, Ruby Hughes and Georgina Haynes all of Freeport, IL, Denita (Chuck) Robinson of St Louis, MO, Deborah Wormley, Carol Wormley, Janice Wormley, and Yvonne Morgan of Birmingham, AL. Brothers Darryl Wormley, Kedric Wormley, and Stanley Wormley all of Birmingham, AL, Shu Ra of Rockford, IL., and a close friend John in Freeport, IL, whom he called his brother. A special Uncle, Sammie Hughes of Freeport, IL and a host of nieces, nephews, cousins, and friends. He is preceded in death by his grandfather, Marshall Hughes; uncles James Moore and W.C. Williams; aunts Clesta Williams and Clydie Hughes; and brother, Greg Jones. Funeral services will be 11:00 A.M. Friday April 19, 2019 at Burke-Tubbs Funeral Home in Freeport. Visitation will be from 9:00 A.M. until the time of service. A memorial has been established in his memory. To send flowers or a remembrance gift to the family of Khensu B. Ra, please visit our Tribute Store. "Email Address" would like to share the life celebration of Khensu B. Ra. Click on the "link" to go to share a favorite memory or leave a condolence message for the family.